JUSTICE LEAGUE MOVIE: Wonder Woman Teaser and Poster Have Arrived! As expected, Warner Bros. has released another teaser and character poster ahead of the full trailer showing of 'Justice League' on Saturday. 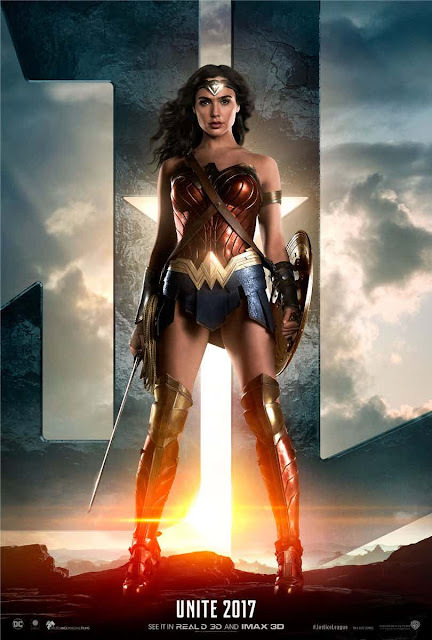 This time, Wonder Woman got her 20 seconds of hype in the video below. The poster is consistent with those of The Flash, Aquaman, and Batman that appeared on Thursday, our hero standing beneath a menacing sky and in front of a brilliant rising sun. A "Dawn of Justice" if you will. Directed by Zack Snyder, Justice League also stars Henry Cavill, Gal Gadot, Ray Fisher, Amy Adams, Jesse Eisenberg, Amber Heard, Jeremy Irons, J.K. Simmons, Willem Dafoe, Julian Lewis Jones and Ciaran Hinds. The film opens in theaters on November 17, 2017.